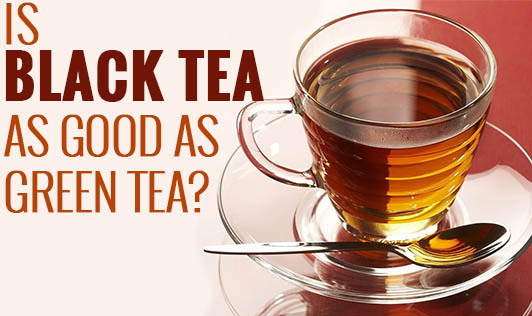 Is Black Tea as Good as Green Tea? I was once curious to know if black tea can do the good that green tea does to me. Having read through many scientific evidences, I was enlightened with the fact that be it black or green tea, they are both enriched with abundant antioxidants, which are 10 times higher than those present in fruits and vegetables. Studies have shown that both types of tea have confirmed similar improvements in Cardio vascular function leading to significant reductions in stroke and heart diseases. Apart from these, studies have shown that black and green tea supports a healthy immune system, prevent a neurological decline and reduce the risk of certain types of cancers. All teas come from the plant, camellia sinensis. They are rich in polyphenols, which are a type of antioxidant. These wonder nutrients scavenge the cell-damaging free radicals in the body and detoxify them. The minute differences between the two are - Black tea is oxidized (allowed to undergo chemical reactions caused by exposure to oxygen) and green tea is not. This oxidation results in color and flavor changes in black tea. Green tea contains a compound called epigallocatechin gallate (EGCg), a powerful anti-oxidant, whereas Black tea contains antioxidants theaflavins and thearubigins that contribute to its dark color and distinctive flavor. Thankfully, the only difference comes with their flavor and color, so it's all about personal preference. "Black tea is the new green for those in the know." So, drink up and derive maximum health benefits.